Happily. It’s a great description of marriage. Who doesn’t want to be happily married? Yet for many, it’s the goal which has gone unmet. Maybe a couple happily got married. Possibly they experienced their honeymoon happily. However, the current state of their relationship cannot be defined by any word related to happy. They want it. Seeing what others have, they desire to have a similar experience. Maybe they think it’s possible with their spouse. It could be that they think it’s not possible in their marriage, but might be attainable with another person. A few believe being happily married is never possible for them. Step 1: Determine the state of your relationship. This doesn’t have to be an exact science, but get a starting point for where you and your spouse believe you are. If you had to number your relationship between 1 (we should divorce now) and 10 (every couple should dream to be us), where would you be? Do you and your spouse agree to about the same number? If so, at least you agree on that. Build from that agreement. If not, why the difference? What does one spouse see as a strength but the other views as a weakness? Step 2: Try to make changes on your own. While most, if not all, couples can benefit from professional counseling, many marriages can be improved without outside help. Start doing something. Schedule a weekly date night. Go to a marriage retreat. Read a marriage book (Click HERE or HERE for suggestions.) Take a vacation. Do something. Talk about your relationship. Consider what you can improve. Get to work. Step 3: Recognize what you can’t fix on your own. If you can improve your marriage by yourself, do it. Moving a marriage from average to good is possible for many people without any outside influence. With a little intentional effort, significant gains can be experienced by many couples. Yet others face situations which they cannot improve without help. Trust has been broken. Gridlock is experienced. No matter how many books they read or attempts they make, they can’t solve certain issues. Step 4: Get help. Make a call. Set up an appointment. 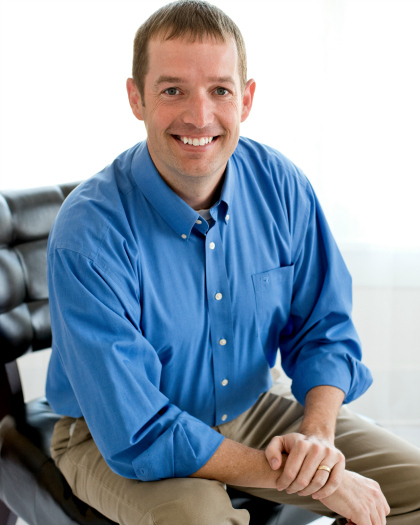 Accept the discomfort of walking into a professionals office and admitting you need help. Then do it. The discomfort will go away a few minutes in. You won’t shock your counselor. You also won’t solve all your problems in a few sessions. Instead, if you consistently go, are transparent, and do the work with dogged determinism, things will change. It might take more time than you want, but if both spouses make the effort, things will improve. Step 5: Never stop. The great hindrance to being happily married is apathy. When couples stop trying, they start dying. Instead, husbands and wives should vow to continually work on improving their marriage. As long as you are striving forward, your marriage won’t be perfect but it has the potential of being very good. Yet when you stop, everything is thrown into question. I wish I could say that if a couple in a bad marriage would simply read my book their marriage would become great, but it won’t. My book can’t make a bad marriage good. It can be the impetus of making a good marriage better. It can possibly be the wake-up call to a couple so they take the actions necessary to save their marriage. But the book alone won’t work. Yet, you should still buy it because it can help. It could be the first step to a better relationship. If it’s the only step, nothing will change. But if it’s the first step of many more to come, there is no ceiling on how things could be. 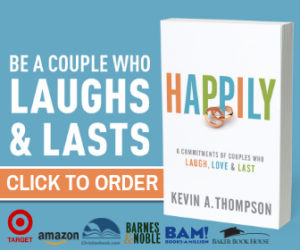 Order Happily: 8 Commitments of Couples Who Laugh, Love & Last. Please add me to the email list. I tried but got an error message. I enjoyed reading Kevin’s Friends book and pre-ordered Happily. Keep up the good work! I committed the sin of having an affair. It was not something I ever thought I would do or wanted. I love my husband but more than once in our marriage he has abandoned me. With holding even hugs, communication and his love. I was starving then and even more now. I feel like it’s a form of abuse…don’t cheat on me but i’m not going to give you anything either. I’ve become more and more depressed and have begun drinking as a way of not feeling the pain. I was sexually abused by my biological father so I have depression and anxiety and PTSD…so not all of my depression is because of my husband but it definitely does not help. He now is drawing the line for himself that if I can’t get ahold of my addiction he’ll have no choice but to divorce me. I have tried on a few occasions and i’m still in search of help. I don’t want to lose him he’s the love of my life.